Who can resist the fascination of watching a skillful drummer at work? Certainly not me and my toes were tapping and hands clapping along when I recently had the opportunity to meet one of the legendary masters of the Uzbekistan doira, Abbos Kosimov. The doira is known as one of the oldest percussive instruments in Central Asia, a frame drum known also as the dap, dayereh, childirma or charmanda. This lightweight drum is made of goatskin stretched over a round frame with metal rings attached on the back, creating a sound much like a tambourine. It is used to accompany both traditional and popular music, even wedding ceremonies, beating out the rhythms and incorporating the musical chimes of the usul - the rhythmic accompaniment to dancing and singing. Originally used only by women, 2000 year old archaeological evidence shows a woman playing a doira. Abbos Kosimov is one of the most widely known doira players, recognized worldwide as a master of the instrument and as an ambassador of Uzbekistan culture. Originally from Tashkent, he has a stellar academic and performance CV, establishing his own music school in 1994 and is the recipient of the presidential title of Honored Artist of Uzbekistan. 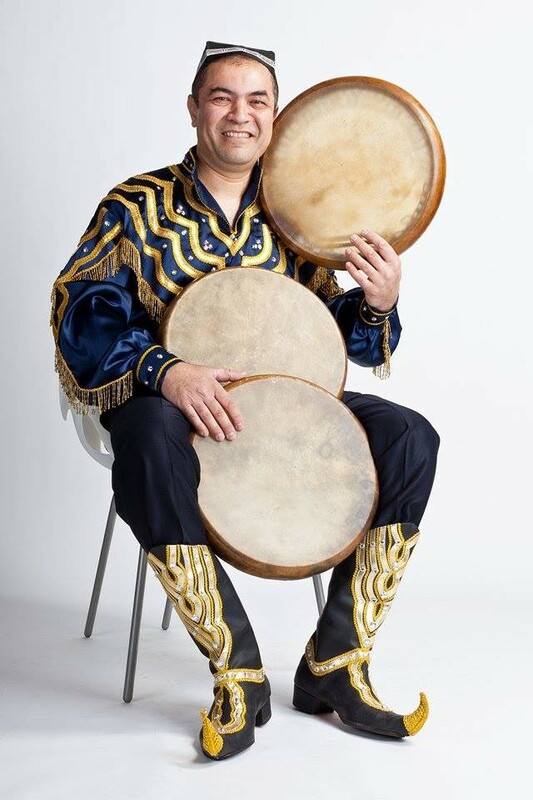 He has participated in international festivals, concerts and workshops around the world and his popular performance group "Abbos" features traditional instruments of Uzbekistan. Abbos Kosimov and his students and colleagues were honored guests at my home for New Year's and all of my American friends and family were thrilled and amazed by his performance. Alternately rousing the crowd with rapid-fire tattoo or calming us with the sounds of nature, we could imagine swirling skirts and flashing jewels in a tribal village or lying peacefully under the stars in the desert. Astounding performance! Abbos Kosimov is indeed very talented musician. I couldn't help but danced along. It is very relaxing as you feel like you are in a tribal village of Uzbekistan. May sounds of Doira be always heard in every family as it is a symbol of happiness.